We believe in walking for enjoyment not endurance and our approach reflects this old adage. 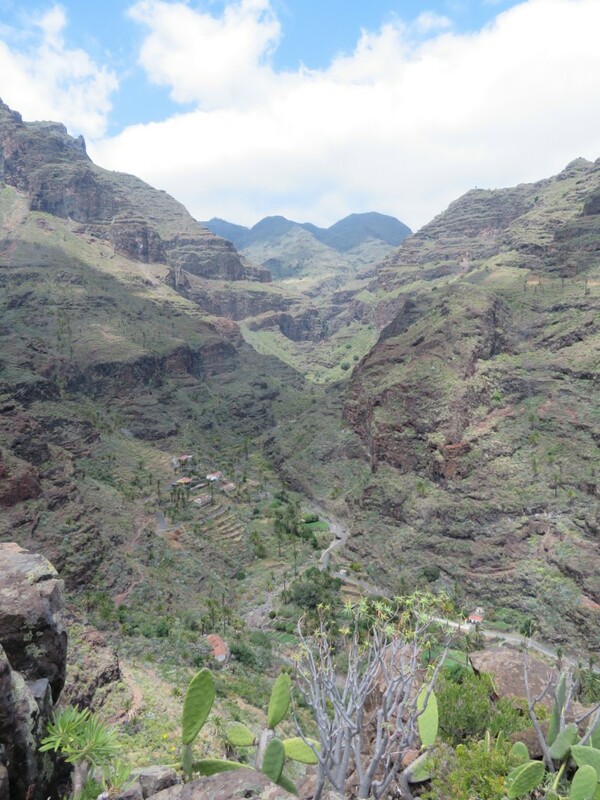 We also recognize that to fully appreciate the beauty and diversity of the unspoiled Island of La Gomera you have to stop frequently and look around you. We start our week with fairly easy walks and adjust our schedule to suit the group's capabilities/expectations. We have a large selection of walks available to us most of which which fall into the Ramblers' B-C Classifications. D: Leisurely Walks for reasonably fit people. May include unsurfaced rural paths. Walking boots or comfortable footwear and warm, waterproof clothing are recommended. C: Easy, mainly on level ground and often paths and tracks. Longer walks than Grade D. Suitable for beginners if reasonably fit. C+: Easy to moderate, for those with improving fitness, offering some modest challenges. B: Moderate, demanding higher standards of fitness and stamina than C+. B+: Between moderate and strenuous, for the reasonably fit. Standard grading for summits taken at a slower pace in summer conditions. Jesús is the main leader but on occasions we also have a small number of other experienced leaders available. In addition to the leader we also have a "back-marker". There are regular ferry services from Los Cristianos to San Sebastian (capital of La Gomera). We normally use the Fast Ferry Service run by Fred Olsen which takes about 50 minutes to make the crossing. Fred Olsen now use a ticketless system so you just need to present your passport for swiping in order to board the ferry. 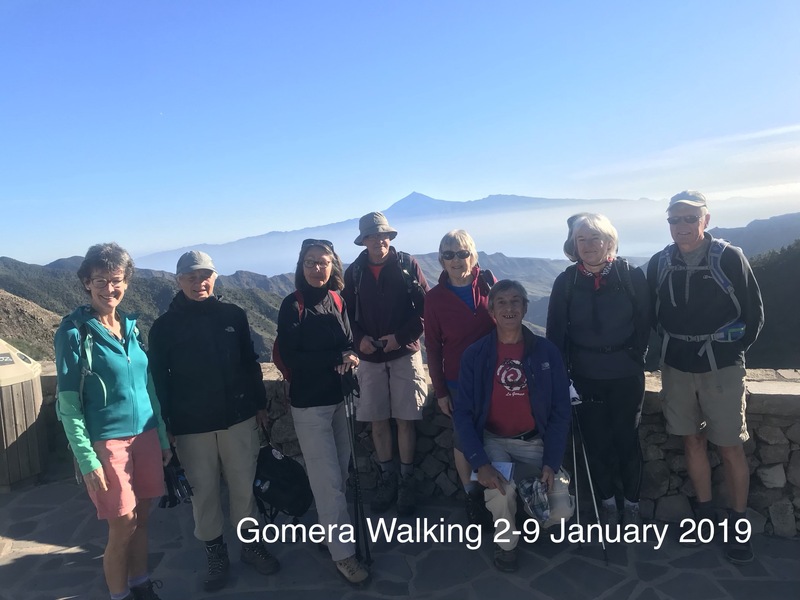 For this reason it is imperative that you ensure you supply us with the correct passport details when you make your booking with Gomera Walking. Our schedule is tailored to flights arriving before 12.30PM at Tenerife South (TFS) airport. We meet you and along with the rest of the group we travel by minibus to Los Cristianos ferry port which takes about 20 minutes. We will explain how to use the luggage system and then if there is sufficient time you can have a look around Los Cristianos. For Premium Package guests....Hotel jardin Tecina now have a small office in the ferry port where you can complete your pre-check to will save some time when you arrive later at the Hotel. If you arrive independently on a different day or time from our group schedule we will make appropriate arrangements for you to join the group on the tour start-date. This may incur additional cost. Our transport will meet you off the 07:30 AM ferry where you pick up your luggage. They will have a sign saying "Gomera Walking". It normally takes 20 minutes once you leave the port to reach TFS. If you have opted for a later ferry you can find taxi's adjacent to the luggage area or the bus station is 10 mins walk away and from here there is a regular bus service to TFS. Our apartments are located about 5 minutes walk from the main village & have bedrooms with twin or double beds, bathroom with toilet & shower, well-fitted kitchenette and separate lounge area. They are all harbour (South) facing and have access to their own terrace on which you can enjoy a glass of wine and watch the sun go down! The apartments on the first floor have a small terrace overlooking the street but also have their own separate sun terraces on a higher level accessed by stairs There is ample room for two people sharing but if you require a room to yourself then unfortunately we have no option but charge a single occupancy premium. We don't like to do this but so far we have been unable to negotiate a better deal with the apartment owners. La Gomera has almost idyllic weather with sunshine almost all the year round. It’s not too hot in the summer and not too cold in the winter. October to April you can expect daytime temperatures in the mid twenties to low thirties and night rarely less than 16 deg C. However at higher altitudes it can get quite cool and sometimes misty with light rain. Very, very occasionally we get two or three days of torrential rain in the wintertime. Check out the annual weather charts here. Yes. If you want to travel earlier than our tour date and stay in Tenerife or a few extra days in La Gomera we can assist you at a small additional cost. Please contact us for individual arrangements. Yes. We are very flexible and happy to arrange a travel package to suit you even if you don't want to walk with us. Check out our Groups/Custom Holiday here. With our Popular Package breakfast is not provided but your apartment has a fully equipped kitchenette and there are several local shops/supermarkets where you can buy tea/coffee and breakfast items at reasonable prices. Our Premium Package includes a substantial buffet breakfast in a choice of Hotel Jardin Tecina restaurants. Walking poles are useful on the mountain paths. If you can’t bring poles with you we have some you can borrow at no charge. There is a very good health centre in Playa de Santiago open 24 x 7 and excellent modern hospital in San Sebastian providing 24 hr round the clock support. Please be sure to bring your EHIC card with you as this means you can get treatment without having to pay in La Gomera. You can find out more about EHIC by clicking here for UK applications or here for Irish applications. It is a condition of booking a holiday with Gomera Walking that you take out travel insurance for the duration of your trip. We will arrange for someone to meet you at the airport and if necessary rebook you on a later ferry to take you to La Gomera. This may incur an additional cost. If you know you are going to be delayed please call Gomera Walking on the number provided in the email you received prior to your holiday. Yes. Hotel Jardin Tecina and all our apartments have free WiFi. Yes. Excellent coverage throughout the island including most walking areas. We restrict our maximum group size to 14 so we can give personal attention to all our clients and there is no minimum....we will run the tour in any event. October to April sea temperature will be between 21 and 25 deg C. We swim all the year round…without a wetsuit!!. Check out La Gomera annual average temperatures here. The beach is about 5 mins walk from our apartments and about 10 minutes walk from Hotel Tecina. It is a pebble beach but usually you can find sandy spots to enter the sea. Premium Package walkers have a choice of 3 heated hotel pools in Jardin Tecina. Hotel Jadin Tecina have their beach club....Club Laurel at sealevel below the Hotel and 5 minutes walk from our apartments. This year they offered a deal to non-residents for €20/day whereby you could use their facilities (swimming pool, crazy golf, sun loungers) including complimentary beach towel and credit of €15 to use in the bar and restaurant. Yes. We can assist you with the necessary hotel and ferry arrangements at very reasonable rates. I have to be honest and say that the nightlife is fairly quiet and if you’re looking for something exotic late and hectic we would have to recommend recommend you look elsewhere!! Electronic Funds Transfer (EFT) or Credit/Debit card. You can select your preferred payment method when you complete our on-line booking form. Yes....we are currently trialling a new arrangement with a company called TransferWise. We bill you in €euro but you can pay in £Stg at current exchange rates more favourable than you can get from your bank. Our return transfer is with the 07:30 AM Fred Olsen ferry which arrives in Los Cristianos at 08:10 AM and by the time you pick your bags and meet our transport you will arrive at TFS by 09:00 AM which is plenty of time for most UK/Irish flights. The next ferry is at 12:00 midday and if you take it you could be at the airport by 13:30 PM. If your flight time suits and you want to take the later ferry we can arrange this. There is no extra cost for the ferry but you may need to budget for a taxi from Playa de Santiago to San Sebastian (€40) and from Los Cristianos to TFS (€30).....usually you can share this cost with other clients who have also opted for the late ferry.